Baby bell peppers stuffed with seasoned ground turkey, cheese, and green onions make a great finger food for any gathering. Use ground turkey, beef, or chicken! Per Serving: 691 calories; 48g fat; 27.2g carbohydrates; 43g protein; 179mg cholesterol; 1332mg sodium. such a fun little app! the kids loved it! Took this to a Cinco de Mayo party and it was a huge hit! Super easy and super yummy! Thanks Mealthy! Really delicious baby bell peppers and the ground turkey taco meat was really flavorful. 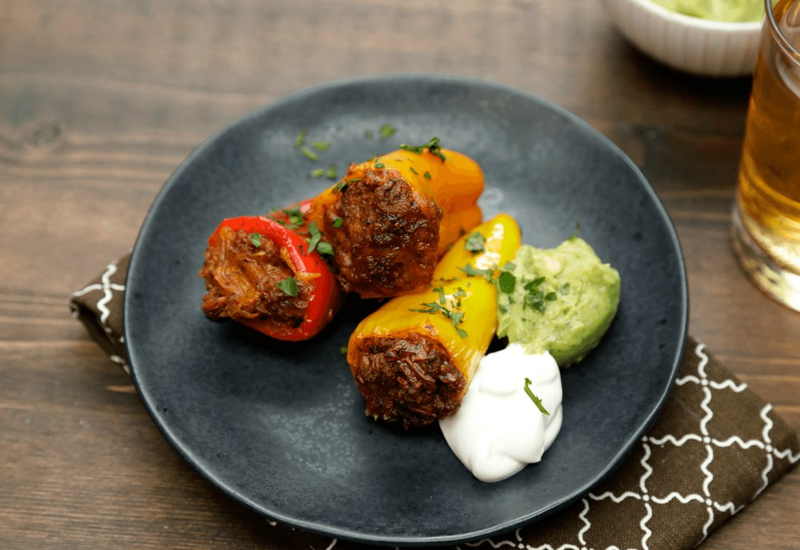 This is a nice switch from the traditional stuffed peppers we normally make. Super delicious! Baby bell peppers are always very flavorful, and combined with ground turkey and seasoning, it made for the best game day party food. I used extra cheese and guac! So good! I'm definitely going to make these again. Such an easy dish, full of great flavors. Great for finger food at a party. Big crowd pleaser. These are great as an appetizer or finger foods at a casual party. The hardest part was stuffing the mini peppers with the meat. What worked for me was using a baby spoon so that I didn't make a mess spilling the ground turkey mixture everywhere.